NHS surgeon Neil Kitchen saved my life. Last week I welcomed Neil into the House of Commons to hand over the royalty proceeds of my book, Doing Time, which was published late last year. 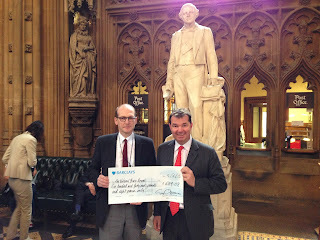 Neil is a consultant neurosurgeon at The National Hospital for Neurology and Neurosurgery at Queen's Square in London, and he is pictured receiving the cheque for £649.08 The cheque handover was made in the Central Lobby in the House of Commons, Westminster, on the exact spot where I had collapsed on April 26th 2011 due to an undiagnosed meningioma. I had raised the money out of the proceeds of the book and a small charity quiz: I have always made it clear that I would not benefit from the book sales, but the National Brain Appeal charity would. All proceeds from book sales, after printing and publishing costs, go to this wonderful charity that supports brain tumour research. "Guy has made a full recovery, and it is wonderful to seeing him looking so well. It is also good to see him continuing to support the research and work of the neurosurgery team at the National Hospital. We will put the money raised to good use." What is Labour's policy on Immigration?